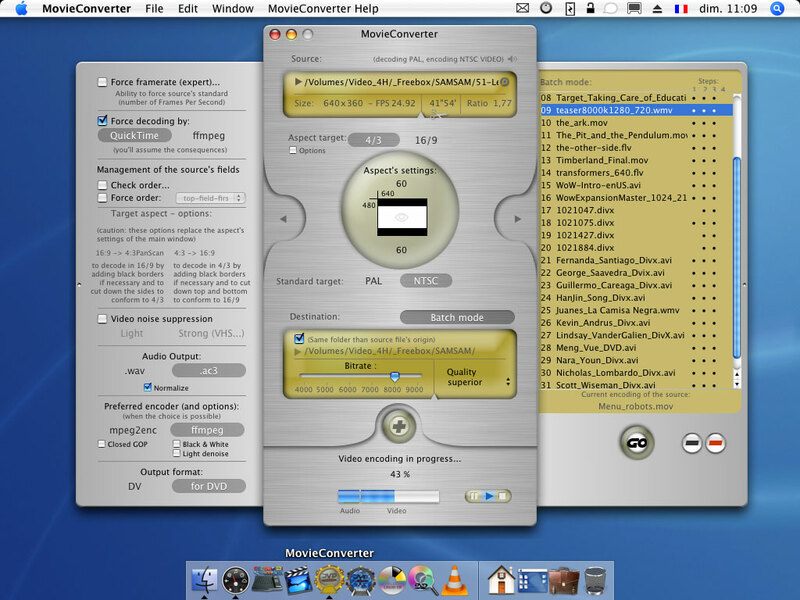 MovieConverter is a Mac OS X encoding software for DVD (and DV), with support for telecine. …but any other type of files too (avi, wmv, etc). Ability to pause the video encoding. Fully automated (detection of the interlaced files, their readout order, etc). Entirely disengageable (for those which do not like the automatisms). Automatic adaptation of the aspect for any video (even the anamorphous ones). Ability to transform any video in 16/9 or 4/3 PanScan (whatever its original size or its interlacing). Convert any video in PAL<>NTSC, without jerk nor loss of quality. Encoding module: New "secure" automatism: some broadcasters (on DVB-T) have the bad habit to tag some approximate information during broadcasting. Now MCS automatically avoid trouble even in case of bad tags. This special info -real or wrong - will be automatically handled without loss of quality. (More technically, it is about a wrong info included in videos about field order). Encoding module: if your video includes chapters (eg: iMovie / FinalCut videos, MPEG4, MKV, ...), MovieConverter keeps them to affect them in the "DVD VIDEO module" (this feature is only available in Leopard and SnowLeopard, sorry for Tiger users). Encoding module: first step to handle E-AC3 audio format, especially used on DVB-T (beta-feature only available in Leopard and snowleopard). Encoding module: less alerts, some ergonomy more (eg: files for editing should not be normalized by default, but a files for broadcasting has to be, so -example- the normalization is automatically adjusted to each needs ;-)). Multiplexer Module: The encoding of your subtitle file (.srt, .ssa) will be automatically detected and applied. You only need to click on "Go". Any module: Improved recognition of the number of frames per second for .mov videos (like those from your editing software iMovie or FinalCut). Encoding module: An error in 'calculation of the additionnal black borders with anamorphic some sources', most often with the aspect 4 / 3 (that an old nasty bug but I had not noticed it and no one notified it to me). Encoding module: The loading of some MPEG-TS (not from EyeTv) could block the application when loading / parsing file. Mux / Demux modules: subtitles are correctly extracted from your mpeg (Demux module), those subtitles could be reinstated with Mux module (so if you need to demux an subtitled MPEG, you could integrate them back ;-)).